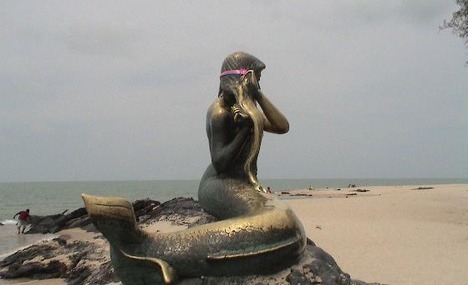 Something fascinating and exquisite i would like to share with my readers about a statue that has been the highlights of Thailand beach and as claimed by the townfolks, the history of that statue existence is real. Ever heard of Ariel, the little mermaid ? Well this isnt Ariel but Songkla Thailand national mascot and also the main tourist attractions as everyone would like to take a picture with her. Observe this statue. This history goes as one of the Thai folk, a fishermen spotted a golden look alike lady near the beach combing its golden hair. Just as he approached, she dive into the sea revealing a shimmering golden Fish like tail from her bottom waist onwards and never resurface again. One day, Thai Prince was walking along the shore, get into his royale ship but due to the waves, he drown and was saved by a golden lady from the sea with a tail. He drew a description and it seem like a Mermaid. He ordered the best Gold and Bronze scupltor maker to carved that mermaid from Solid Bronze. Jasmine and roses are offer to her as more and more sighting are heard whenever items or people drown in that sea saved by a golden lady. Assuming and believing it might be that Golden mermaid, she is being worship as a goddess. 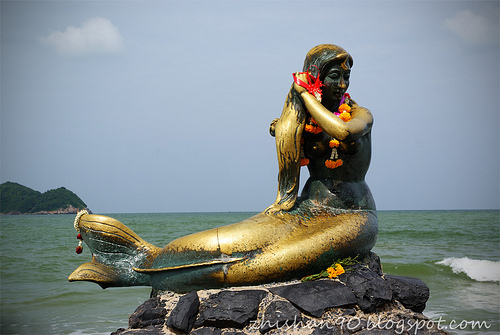 Tourist are free to took pictures with her and this is a must see tourist attraction when one visits Songkhla Beach. Overlook behind her is the South China Sea where the infamous Nyai Roro Kidul lives in – An indonesian Folklore about a Sea Queen who controls the ocean if the south Sea. This entry was posted in Ishq Galleries, Ishq StyLeLiFe.